Jacob Flynn is fulfilling his college dreams with help from his mother. Like many young adults his age, 20-year-old Jacob Flynn headed back to school this fall for his sophomore year of college. But there were no sad goodbyes with his mom, Cheryl. Cheryl not only drove him to Quincy University (QU) but also lives with him full-time during the week in their own apartment on campus. Jacob has cerebral palsy and is a participant in the University of Illinois at Chicago’s Division of Specialized Care for Children (DSCC). He requires round-the-clock assistance because of his mobility issues. Cheryl decided to become Jacob’s personal aide so he can fulfill his dream of earning a college degree. The mother-son duo says QU has been the perfect fit for Jacob’s needs. It’s also helped him gain a greater sense of independence. Cheryl said she’s always encouraged her son to aim high. “Just know that it’s possible. Some people will say it’s not, but it is. You have to work hard and try your best and you’ll make it,” Jacob said. “I’ve always pushed him like a normal child,” she said. Jacob earned good grades while attending Brown County High School. As he and Cheryl researched college options, they learned that personal aid services would only be available for up to 16 hours. Cheryl knew that amount isn’t sufficient for Jacob’s needs. She decided to become his personal aide to make sure he received the right accommodations and support. The next step was finding the right college. 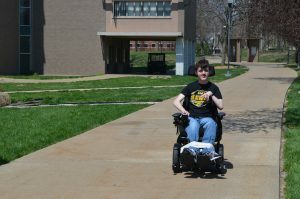 Jacob said he was interested in attending a small school so he could easily get around campus. He and Cheryl eventually toured QU, a school of 1,100 students. They immediately felt right at home. “The people were very nice,” Jacob said. Cheryl joked that once Jacob saw the pizza oven in the cafeteria, he was sold. Jacob also received an academic scholarship from the college in addition to a scholarship from the Tracy Family Foundation. 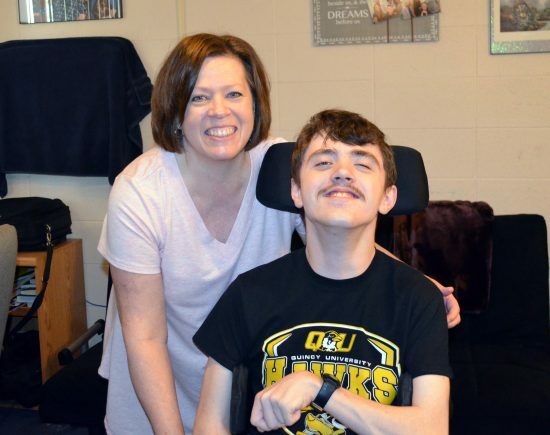 The Flynns said QU staff members were extremely helpful in letting them look at available apartments and measuring doorways to ensure Jacob’s wheelchair could fit. They were able to move into a first-floor, accessible apartment in the center of campus, close to Jacob’s classes and the cafeteria. While they were moving in, a professor not only helped them unload their van but offered to check if Cheryl could get a discounted meal plan so she could eat with Jacob in the cafeteria. The college’s dining service, Chartwells, offered to let Cheryl eat on campus at no charge. The free meals have been a huge help, she said. Jacob meanwhile has taken a full load of classes each semester. He initially wanted to major in computer science but changed his mind to focus on history. 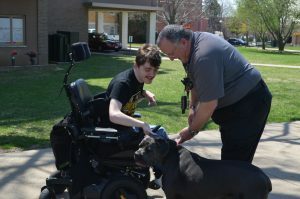 Jacob visits with Quincy University Director of Safety and Security Sam Lathrop and his dog. During class, Cheryl takes notes for Jacob. He also uses a dictation program to type what he says. Jacob also has extended testing times for exams and tells Cheryl what to write. Cheryl said that though she is on campus with her son, she does her best to “take off her mom hat” and let Jacob do things that a typical college student would like to do, like eat junk food and go to dinner with friends. Jacob says he enjoys the greater independence. He’s become well-known on the Quincy University campus and has met people from around the world. Jacob earned a 3.9 GPA and was also nominated for QU’s Freshman of the Year. He also received a leadership award. Jacob and Cheryl say it’s important for youth with disabilities to start their college planning early and make time to speak with college staff and other students. The Flynns also use their DSCC Care Coordinator, Kathy, as a resource to help with any of Jacob’s equipment needs, such as a wheelchair lift for their vehicle, and questions about the transition from pediatric to adult services. Jacob said he wants his peers to see that people with disabilities are no different than they are. He also wants to encourage other youth with disabilities to stay focused on their goals.